Colorado River Pikeminnow at Bubbling Ponds Hatchery. Appearance: The Colorado River Pikeminnow, once known as the Colorado River Squawfish, is North America’s largest minnow (family Cyprinidae). Historically, individuals grew up to 6 feet long and weighed more than 100 pounds. Today, specimens rarely exceed 5 pounds. Adults are generally dark brownish to bright olive green on the back, silvery white or yellow along the sides, and dingy yellow or white on the belly. The head is cone-shaped, with a large nearly horizontal mouth. The body is elongate and streamlined. Diet: Adults predominately eat other fish, including young of their own species, as well as small mammals, birds, and reptiles. Young eat crustaceans and aquatic insects. Habitat and Range: The Colorado River Pikeminnow is endemic to the Colorado River basin from Wyoming to Mexico and once occupied both the Colorado and Gila river drainages in Arizona. 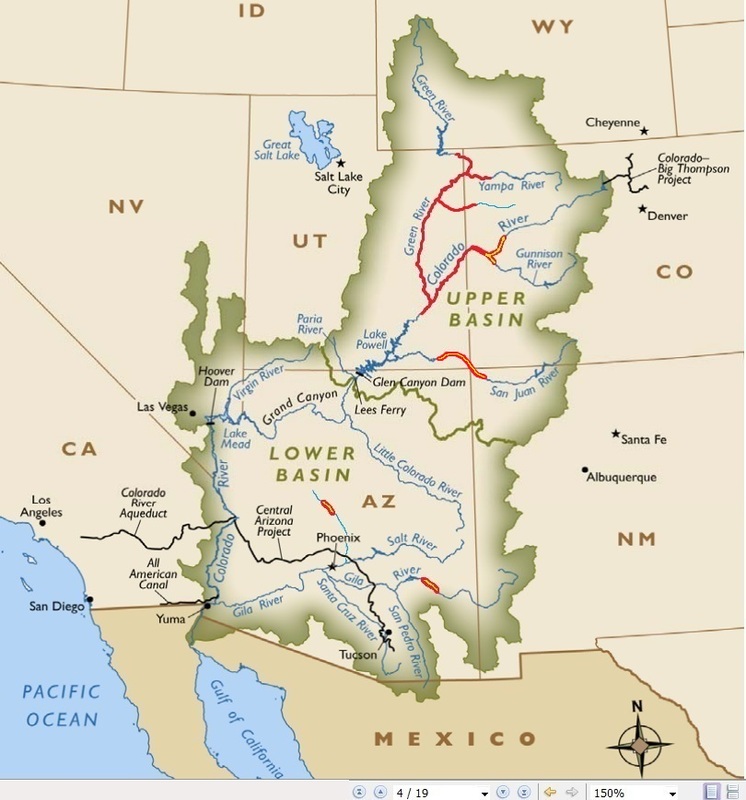 In the Gila River basin, their distribution extended as far north as Perkinsville on the Verde River, eastward to Ft. Thomas on the Gila River, and as far south as the delta in Mexico. Currently, Arizona has no natural populations, but the Department raises pikeminnow at the Bubbling Ponds Hatchery and stocks them in the upper Verde River. 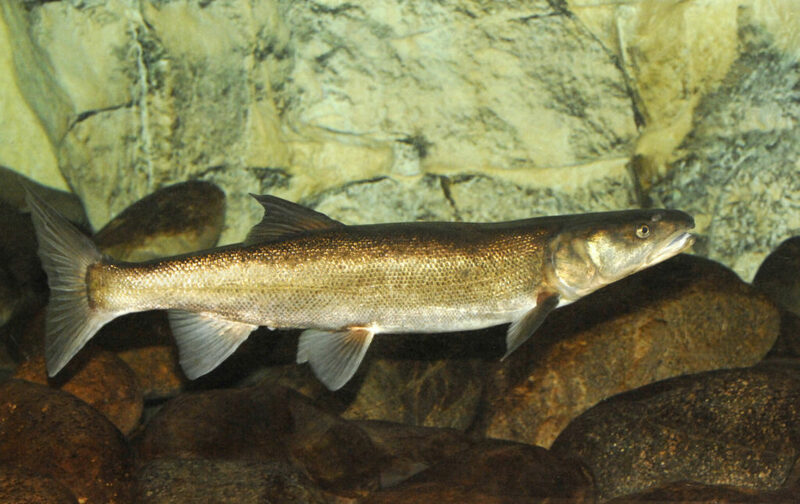 Largely due to conservation efforts, reproducing populations of pikeminnow currently occur in the San Juan River basin, upper Colorado River basin, and Green River basin. Breeding: Pikeminnow are long-lived (up to 30 years) and slow growing (about 1-2 inches per year). They mature at 12-13 inches and 5-6 years. Spawning occurs in late spring to early summer; spike flows during this time cue pikeminnow to migrate to spawning areas. They have been known to migrate more than 60 miles to join concentrated spawning aggregations. Adults concentrate in shallow riffles and runs during spawning. After hatching in gravel, larvae drift unknown distances downstream. As they age, juveniles tend to move upstream and congregate in warm backwaters. Status: Federally listed as Endangered in 1967 under the Endangered Species Act. Threats: Pikeminnow were once so abundant in Arizona’s large rivers that they supported a seasonal commercial fishery. By the mid-1960s they disappeared from their last holdout in the state, the Salt River Canyon, due to a variety of factors. Dams that impound rivers, alter downstream water temperature and seasonal flow patterns, and block fish migration, were partly responsible. Nonnative fishes that compete, or otherwise interact with or prey upon small pikeminnow, also contributed to the decline. In Arizona, no critical habitat is designated, thus, reintroduction efforts are considered experimental nonessential under the Endangered Species Act. Actions: In Arizona, hatchery-produced Colorado River Pikeminnow were reintroduced to tributaries and mainstem reaches of the Salt, Verde, and Gila rivers in Arizona during the 1980s in an effort to recovery the species from near extinction. But low stocking success of small fish, primarily due to predatory-induced mortality from nonnative fishes, forced a decision to stock larger fish (up to 16 inches) and reduced the stocking distribution to only the upper Verde River. Aggressive research and management in the Green River of Utah have shown recovery is possible. Most recently in New Mexico, pikeminnow reintroduced into the San Juan River are reproducing and the offspring surviving. Distribution of Colorado River Pikeminnow (photo courtesy of USGS).